Dear Diary… the longest post you’ll ever see here! Every day when Himself comes home the first thing he asks is, “What did you do today?” I don’t think he really wants to know, it’s just a conversational gambit thingy but I usually am unable to answer. I know I’ve been busy all day but most of it was apparently not notable. So I thought I would let you suffer through a day with me and lets see what it is I do all day! 5:32 am: Woke, glanced at the clock, sighed and got up. Started the coffee, Himself gets it ready before he goes to bed so I just have to push the button. Checked the temperature. It was 63 in here, not really cold but chilly enough to warrant a fire in my opinion so I built one. Poured coffee and turned on the tablet, checked my usual morning sites and email, by that time Himself was up. So I got dressed and started breakfast. Eggs and sausage this morning, toast & applesauce. 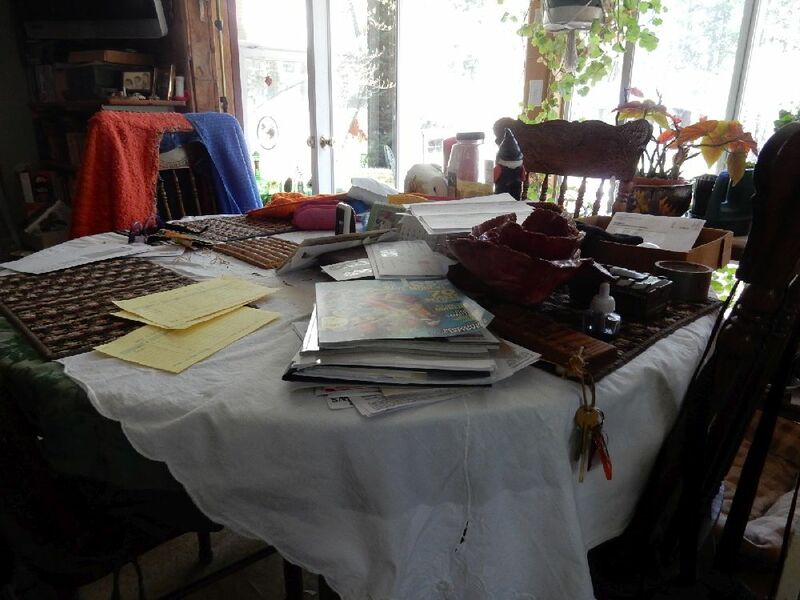 Then, lets see… Printed out paperwork for loom orders, boxed up same, let the cat out, printed postage and hauled them out the the truck so he could drop them off in the mail box (it’s a big one!) on his way to town. Answered some more email, put my shoes on and managed to get out of the house in time to meet Tsuneko for our morning walk. Lovely warm morning, I left the window open we I left, the fire having been long out. Visited with a couple neighbors and our old mailman on the way. Jack has been delivering mail up here for many many years and loves to talk. It was his idea for us to put up the big box so i don’t have to drive to Trinity Center to the post office to mail the packages. He’s got his grandson taking over the route, (nice boy) but he still does Monday and whenever Peter needs a day off. I wore just a light sweater this morning and it was getting to be too warm by the time I got home. Cat weather~ see below! 12:00 Opened up the house, turned on the drier to freshen up the load I didn’t get folded yesterday, made my lunch salad and am now typing this. Next I’ll eat my lunch while defeating Evil with my Viking hero- that’s my noontime treat. Rest of the day coming later…. 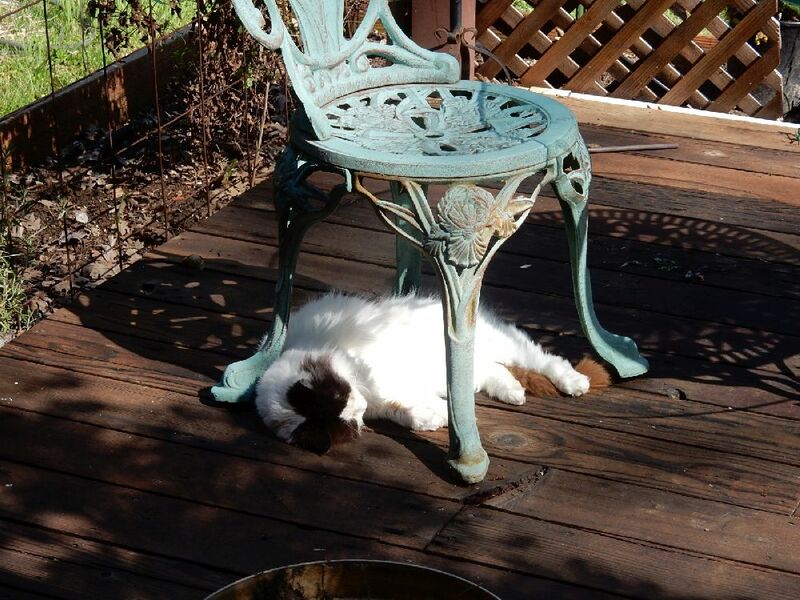 You know it’s a warm day when the cat naps on the deck. she’s loving the sunshine! After lunch cleaned up in the kitchen, loaded the dishwasher and washed the bread machine pan, ready for the next batch. Got sausage out of the freezer to thaw for tonight’s meatloaf. 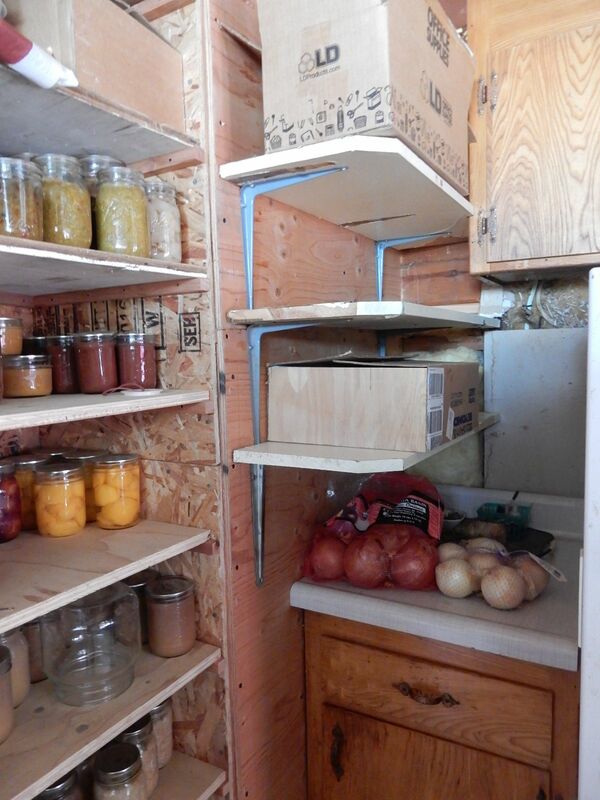 Brought in and folded rest of laundry while I was there also put away the soup I canned yesterday and straightened stuff out for the new shelves he built this morning. Planted kale seed and some marigolds. Also some garlic bulbs that sprouted in the kitchen. Dunno if they’ll make new roots or not, but decided to chance it as they looked fat and healthy. 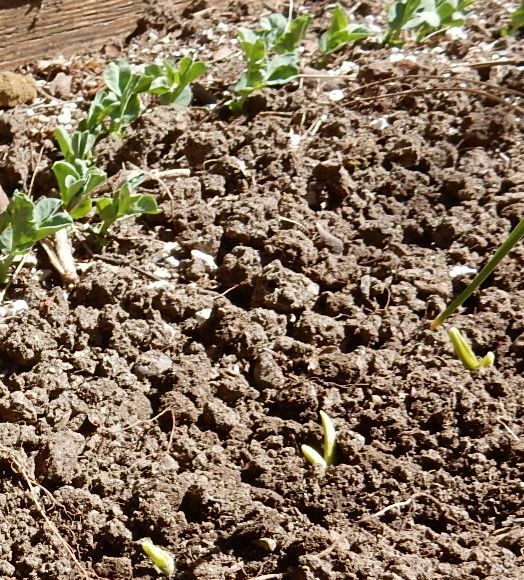 The peas are showing leaves now, too. 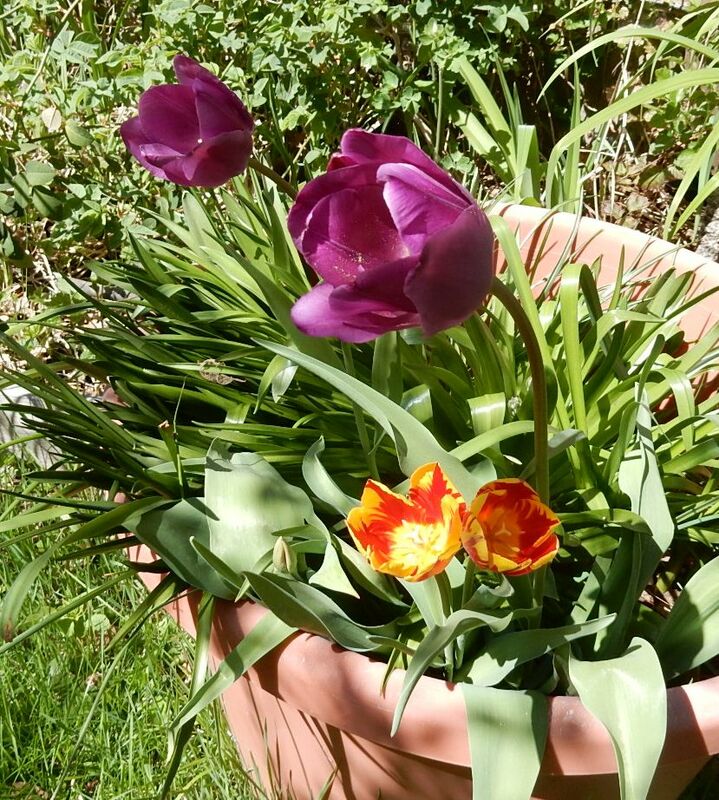 And I have some tulips blooming just across the path. 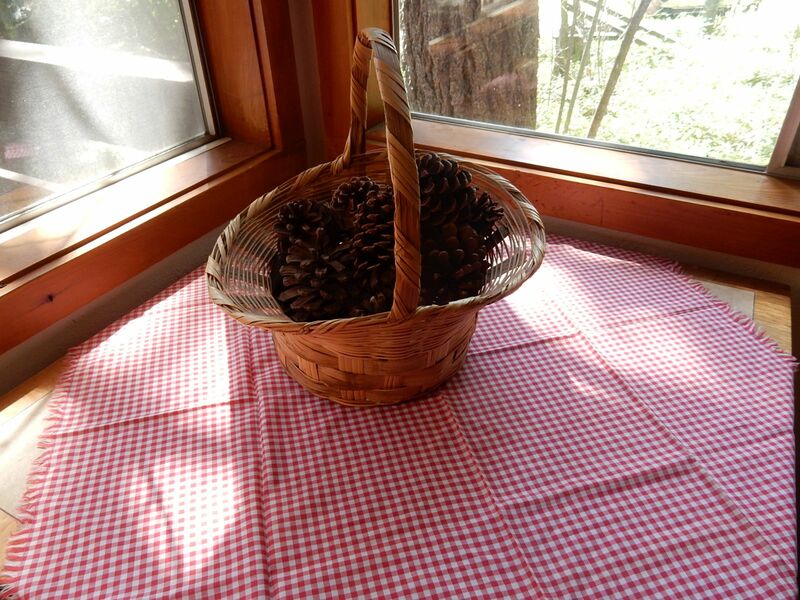 Gathered pine cones for a basket, found a checkered cloth, and “decorated” the corner table in the rental cabin. Mom-in-law says I am not to clean it before she comes in mid May as she’ll need a project while she’s here. All it needs is dusting and airing out, tho I intend to paint the back bathroom, it’s a gloomy place as is. Tossed the kitchen rugs into the washer. I’ll mop tomorrow. 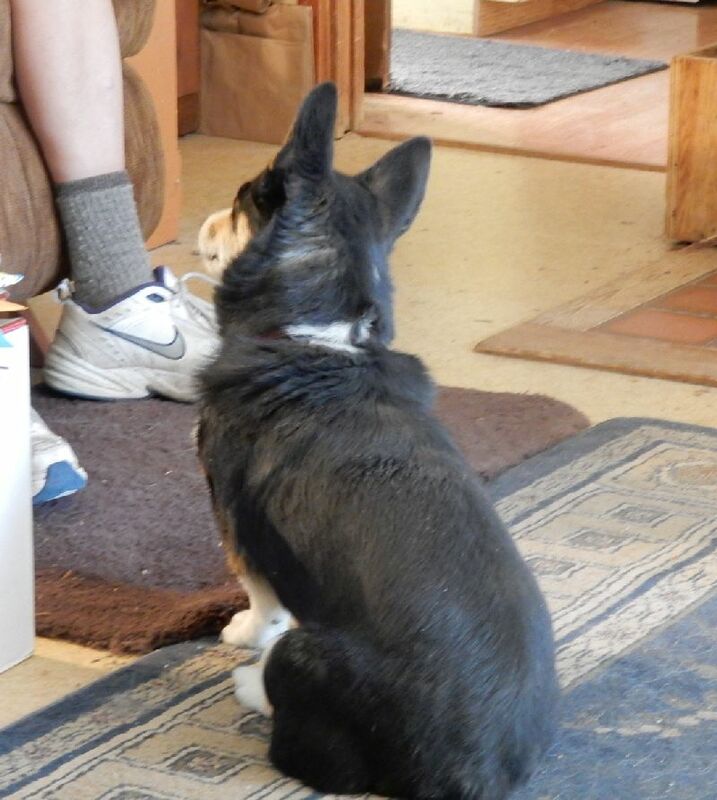 3:30 pm Himself has come in now and he & the dog are sharing a bag of salami. So I guess it’s time for me to head into the kitchen and assemble the meat loaf. I baked hamburger type buns and am planning meatloaf sandwiches and slaw for dinner. I might bake a batch of brownies for the game later. Meatloaf in the oven. Decided against the brownies, too much oven. Had a graham cracker crust in the pantry (love $General!) and a packet of vanilla pudding plus a can of cherry pie filling. Not fresh strawberries but it’ll do until they come along in another month or so! And it’s pretty! 4:30 Dog has quit following me around, she was smelling hamburger and thought I was making her dinner. She’s ever hopeful! Disappointment! I don’t have to make hers for a couple more weeks, just made a new batch. Her dinner is thawing on the counter so she’ll get it at the proper time. 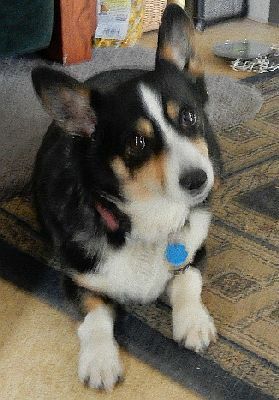 The vet put her on grain free because of a chronic ear infection, says grain feeds the yeast. So I make her meat and veggies & freeze them in baggies, she loves it but I can’t see that it has helped her ear problem much. But now I’m going to sit and read a new knitting pattern to see if I really want to do it. My loom and yarn is ready for when the game comes on this evening. The Giants are playing the Nationals, coming off a win and a fun game with the Angels! 5.35 pm: Meatloaf is done, slaw’s made, as is dressing. Do we need beans? Nay. Himself is reading the news, I’ve been doing x-words here, Jays are fussing at something. Who knows? Jays are always bitching about something. They are just a mouthy group. I guess that’s why I like them- We have much in common! The temperature is starting to fall, too, so I think I’ll close up now. Seems a shame but I don’t want it to get too chilly in here for old people! Dinner’s over, time for the kitty to go home. She lives in the studio since there’s no room here for that necessary box that house cats need. Dishwasher is loaded and going. Game not on for another 10 minutes so here’s the end of my day. 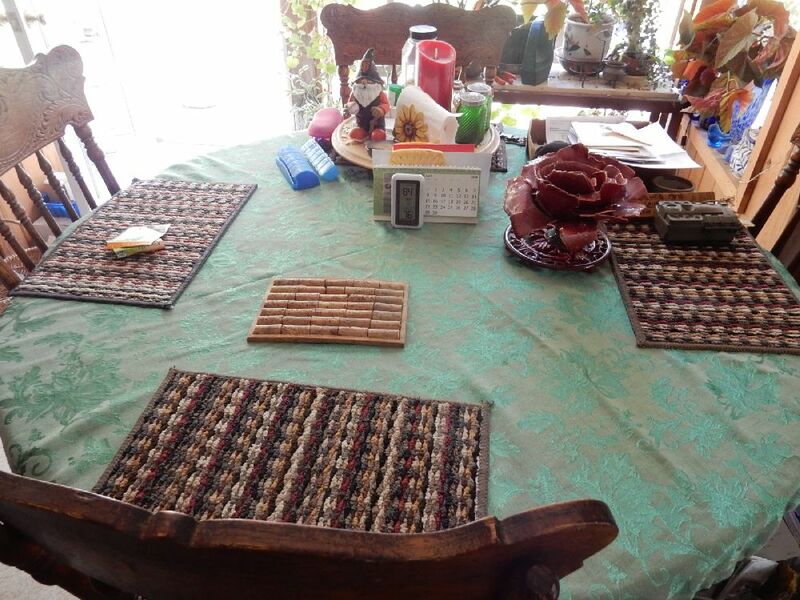 Game and weaving a square. Last email to my sis or both, take my melanin pill (it’s supposed to cure my tinnitus), brush teeth – all the usual bedtime stuff and off to dreamland. Well, if he had asked what I did today, I could have told him. ← I am finally going to learn how to use this blog thing… I hope. Wow I feel tired just reading all of that! Lol! I am really lazy compared to you! Great post.